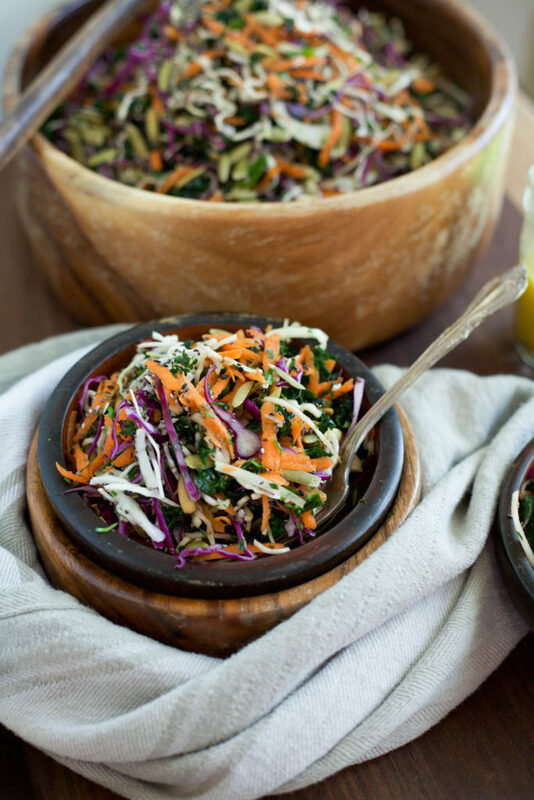 This vibrant Healthy Simple Coleslaw is packed full of nutrients and flavor better than any store bough coleslaw, plus it’s easy to make! I love love this salad! I honestly didn’t really know what to call this slaw salad dish I made. So I went with Healthy Simple Coleslaw, it works for me! It also makes a colorful mess in the bowl, gives your body all of the nutrients it needs from awesome Winter vegetables, and tastes better than any salad at the store. 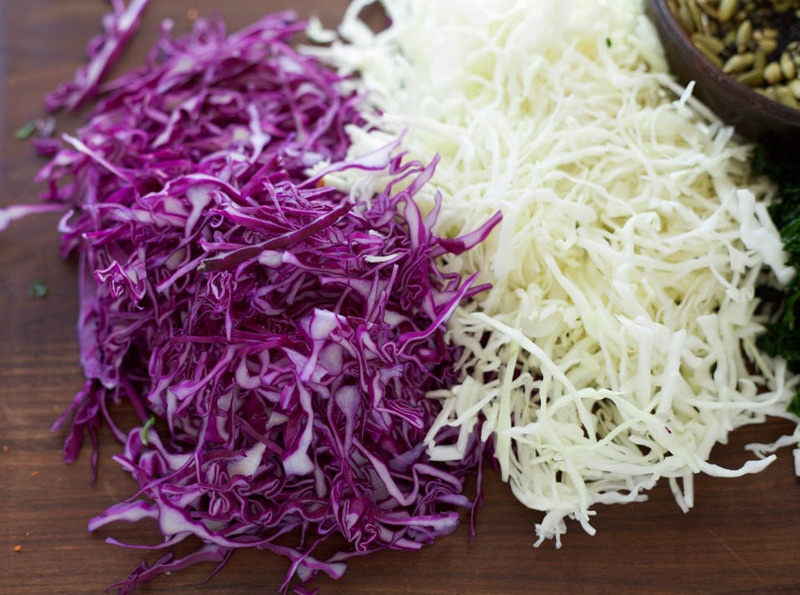 I’ve seen this style slaw on menus and in those pre-made salad cases at the local grocery store. It’s all good, some of them taste really good, but this one tastes way better! After all, it’s homemade, so win on that, the dressing likely has much less sugar and salt, win. It’s also so much fun to make and looks so pretty when you combine all of the ingredietns together in your favorite giant bowl. I made fish tacos this evening to go with salad, been craving some fish tacos lately. I also made some roasted pork tenderloin for a post and served it with this slaw when I was recipe testing. 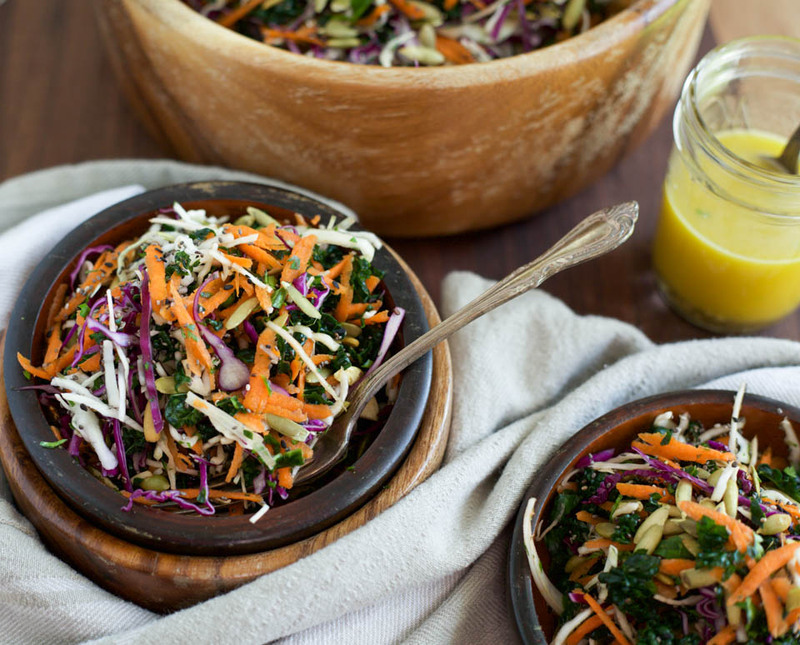 So far this is my favorite go to Healthy Simple Coleslaw recipe that can be made all year long and enjoyed with so many things for lunch or dinner. Maybe add some beans for a complete and healthy lunch? Sounds good to me! 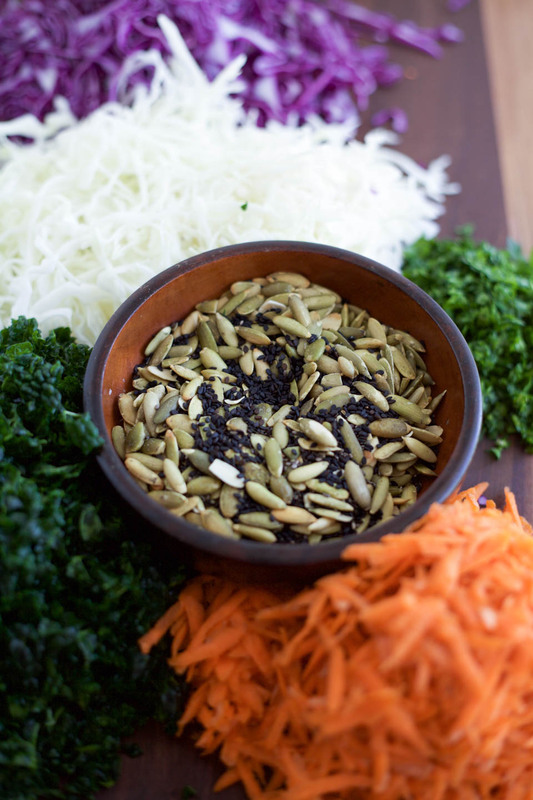 In a large bowl, combine cabbages, kale, carrots, parsley, and seeds. Toss to combine well. The easiest way to make the dressing is to add all the dressing ingredients to a medium jar with tight fitting lid, shake for 1 minute until combined well. If you don’t have a jar, add everything except olive oil to a small bowl, whisk to combine using a small whisk or large fork. Place bowl on a kitchen towel. Slowly drizzle olive oil into orange juice mixture while whisking vigorously to combine. Taste for seasoning, add salt and pepper to taste if needed. Pour dressing over cabbage mixture, toss to combine using tongs or large spoons. Serve immediately or store in an air tight container for up to three days. Recovering from flu and this is just what I need: simple, healthy, vibrant bowl of salad ! Thank you for sharing ! This really does look very vibrant and colorful! The ingredients are a great refresher! Would definitely make this for a Saturday brunch! or always because why not! Oh wow, just love how vibrant this is!! Also love how simple it is, the simple things really are the best most of the time! I totally agree, simple, beautiful and easy! Thank you so much! I would douse some extra vinegar on this and eat it all for lunch! YUM! I may have done the same :). This dish looks beautiful! I bet it tastes as good as it looks! Beautiful colors and very interesting combination of flavors! I love cole slaw! Yours is packed with all sorts of color and flavors! 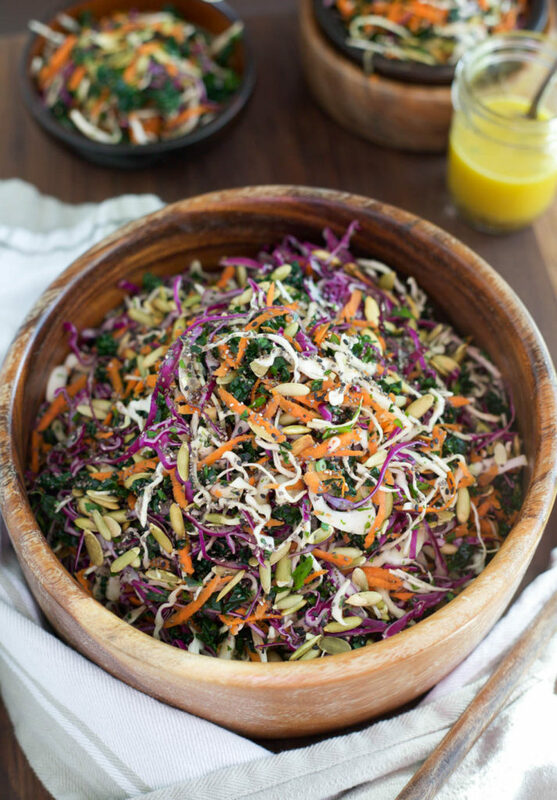 I just finished eating an Asian slaw I made…and now I want to make your vibrant, delicious version! Awesome, thank you! I love Asian slaw too. MMM, I love homemade coleslaw and totally agree that it goes so well with pork. Sounds perfect.